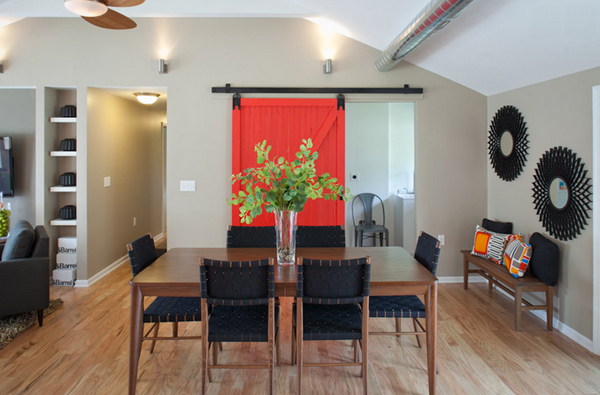 Focal points should be highlighted in every room of your house. When staging your home for sale, your goal is to enhance and draw attention to these special features so that home buyers will fall in love with your house. Typically, when you enter a room your eye is automatically drawn to a particular feature that stands out. It might be a window with a breath-taking view, a dramatic architectural feature like a spiral staircase, a beautiful French door or a lovely fireplace. These are the focal points of a room and important elements to consider when you are selling your house. Check the list below. 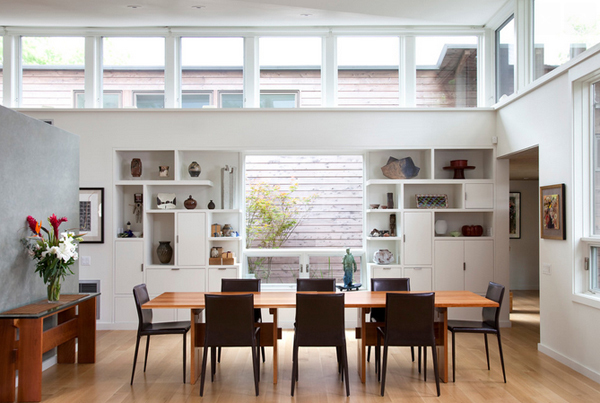 The large living-dining room lacked a focal point and storage. To compensate for this we designed a built-in that functioned as a buffet, china and display. 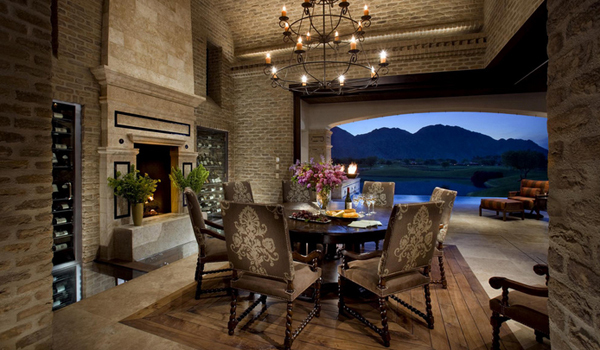 The dining area is wonderfully lit by natural light, creating a delightful atmosphere. Contemporary artwork is also displayed where it will benefit from the light from the nearby glass doors. 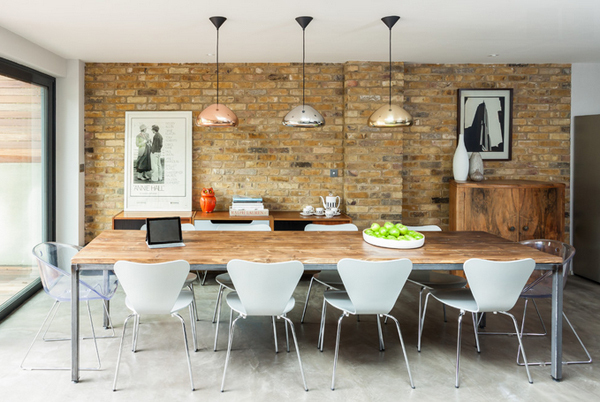 The choice of art, including a print of the Empire State Building in New York, breaks up the plain brickwork in the dining area. The dining room and mantel are original to the house. The team updated the lighting, paint, fireplace surround and hearth, mixing in mid-century modern and contemporary elements. The designer considered the lighting over buffet as well as granite top. By providing this interior courtyard at the intersection of the two legs of the L, the architects ensured that each room gets natural light from at least two sides. This again keeps the interior light and bright and, once the courtyard landscaping matures, will allow views of nature from every room. 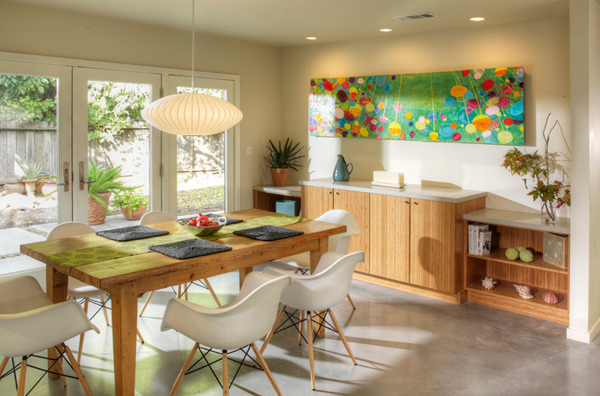 The balance of light in this dining room is just amazing! 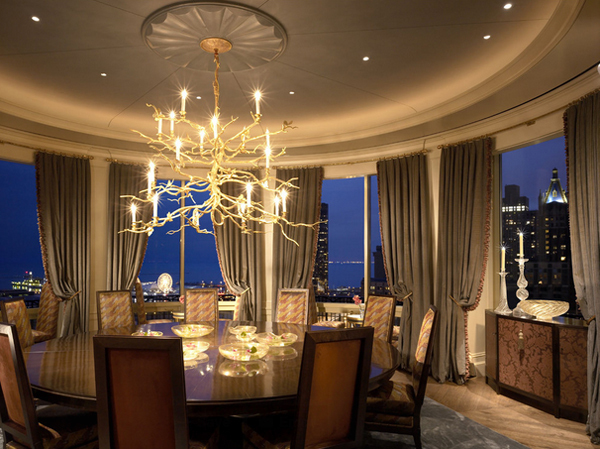 Here we have a stunning chandelier and a stunning view. The chairs are just splendid but I find the chandelier small for this space and the fireplace seems to be missing more stone finish. 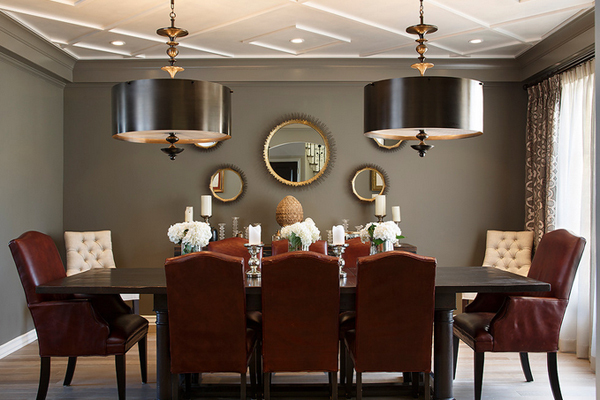 Nothing says “formal dining” like a set of well-upholstered chairs to go around a traditional table. The cushioned back and seat tell the diner you are in for a multicourse meal full of delicious treats and good conversation. I think you can include deer antlers in absolutely any décor. These cast aluminum antlers fit right in with this eclectic mix of mid-century modern, traditional and contemporary pieces. Architect Charles Delisle respected the history of this home in California’s Portola Valley, keeping the spirit of the era alive via a mix of contemporary and custom pieces. A repurposed skylight sets the stage for the new kitchen eating area. Complete reconstruction of the entire space including a new gas fireplace with antique salvaged mantle, custom coffered ceiling and built ins flanking fireplace. Image: MAK Design + Build Inc. The wood cabinets are interesting which match the table perfectly. The choice on the chairs may be a bit weird, but it goes a bit well altogether. Once you determine the table you want, you’ll need chairs to seat your guests. “Most people buy dining chairs for looks without giving enough attention to comfort,” says Triggs. Seriously comfortable armchairs have the warmest spot in this kitchen. 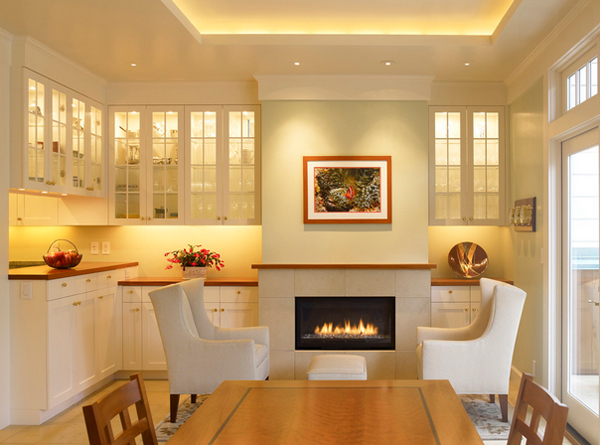 Note how the uplighting, under cabinet lighting, and lighting within the cabinets gives the room a sunny glow. “Adding window treatments and rugs really softens a space,” Umansky says. Stripes on the rug and unfrilly window treatments maintain the couple’s urbane style, while patterned chairs and a wood table add warmth. 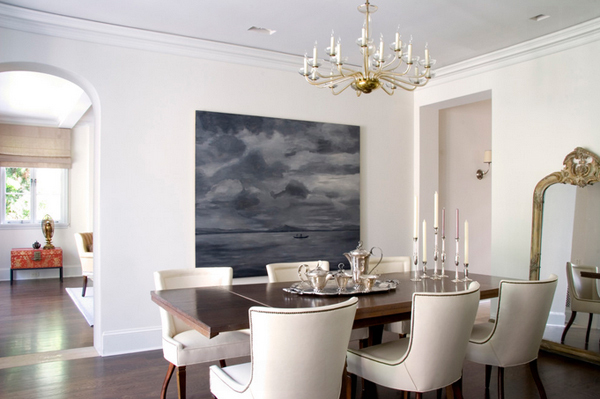 Abstract art and a contemporary light fixture are a stunning focal points. 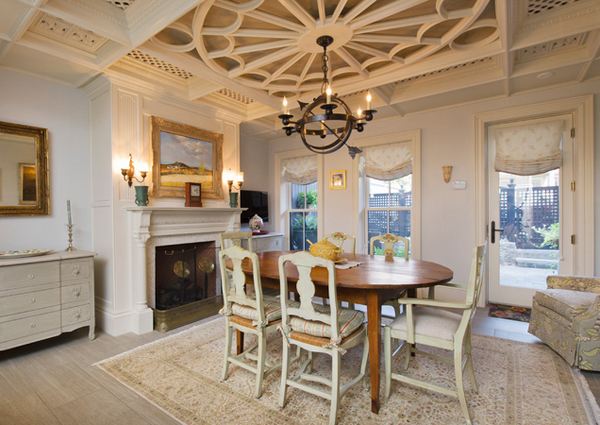 Image: Design Line Construction, Inc.
Ceiling trim can also reinforce a room’s focal point. This can be especially worthwhile in a room with a tall ceiling. 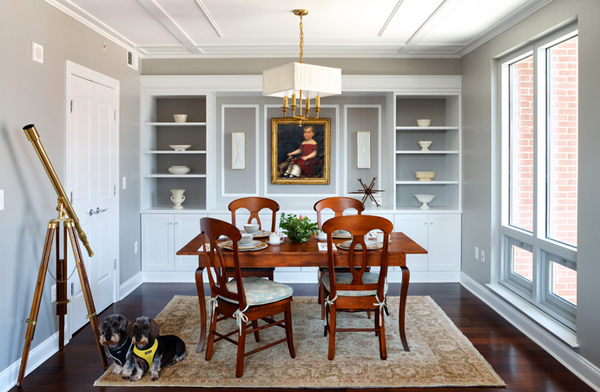 Rather than the ceiling’s being undefined and unclear here, the trim reinforces the upper reaches of the space and leads us to a gathering spot. 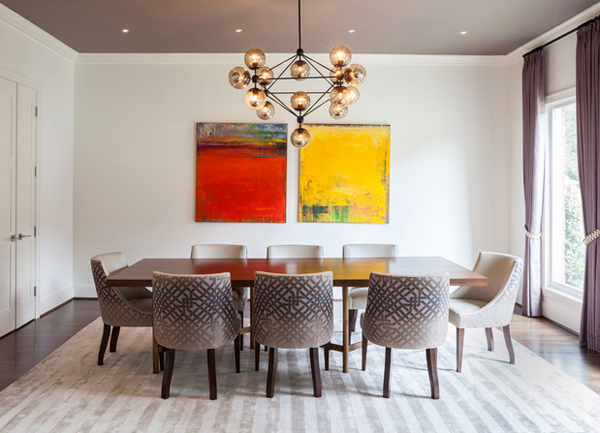 The central elements of a radially balanced room – like the dining table and light fixture in this dining space – become the immediate focal points. The chairs, sculpture and print all radiate out from this central point. 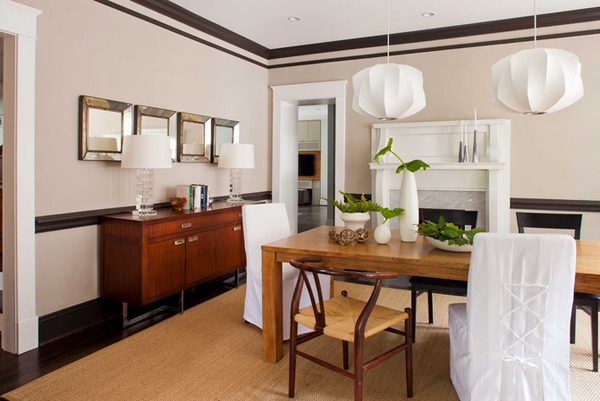 Your furniture placement and accessories should be arranged around focal points. 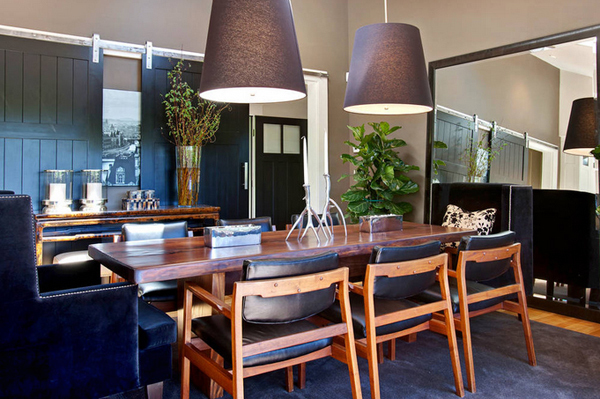 A bold or lovely focal point will also distract home buyers from seeing the flaws. 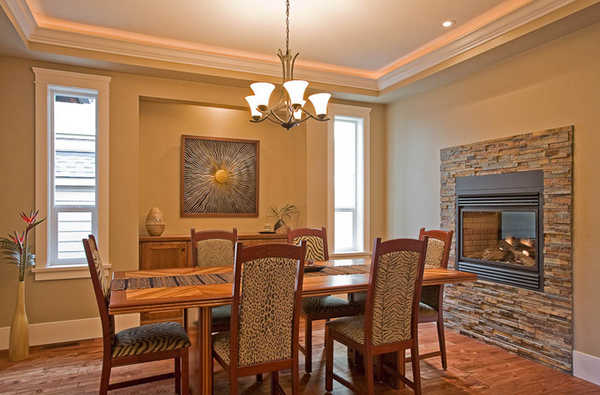 With that in mind, you can choose whatever focal point you want for your home.